These reports on Pope Francis were a good excuse to write about a problem that has been on our mind for some time: Clericalism at the Institute and it's seminary. 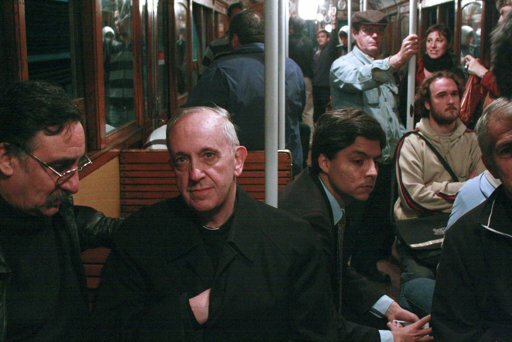 By now many of you have heard how Pope Francis - way back when he was only an Archbishop - used to ride the subway, take the bus, cook his own meals, and even help clean up when his fellow Jesuits met. It must surprise IVE seminarians and nuns that an Archbishop from Argentina would do these things, because that's certainly not how their Argentine IVE superiors behave. Instead, within the Institute there is an aura of elitism, chauvinism, and - most troubling - the regular practice of clericalism. Most write it off as cultural, but it is not. Neither is it normal among religious communities. As we have mentioned before and as we will explain below, this is another example of how the Institute's constitution is not something they follow - rather, it is simply for show. Clericalism at the Institute includes, but is not limited to, the two most obvious and easily verifiable examples we cover below. The simplest and most easily verifiable instance of this clericalism is their mealtime practices - it's also a nice contrast with stories of Pope Francis, as Archbishop, cooking his own meals and cleaning up at his order's events. At the seminary, the seminarians eat poor tasting, expired, and often rotting food, frequently eating the same meal over and over for days at a time. Meanwhile, the priests - though eating in the same area, although at separate tables - have a different meal of better quality, fresh food, complete with wine and dessert. The priests don't ever take any part in serving or cleanup either - that's all for seminarians or sisters to do. This is easy to verify. Simply attend one of the Friday "Eutrapalia" pizza nights at the seminary and you'll be observe these points: there are "special" pizza's reserved for priests only, priests are served by seminarians, priests get the option of wine and dessert, and when it is done only seminarians clean up. Wanting to set up a hierarchy of food is debatable, but claiming that you always choose the worst (see their constitution below) when you actually demand the best available and leave the worst for others is simply dishonest. They force their seminarians to live out the vow of poverty according to their constitutions, but the priests themselves actively flaunt this vow in front of all the seminarians who are under their authority for formation. Another instance of this clericalism is a strong contrast to images of Pope Francis on the subway: the IVE priests don't exactly use public transportation. The Sisters at the novitiate are at least a 40 minute drive from the seminary (with no traffic) and the priests from the seminary give spiritual direction to these sisters. However, instead of getting in one of the many cars at the seminary and driving to the sisters and back, the IVE priest makes a sister drive to pick him up, drive him back to the sisters house, then back to the seminary, and then drive herself back to the novitiate. So a sister spends three hours in the car, so that the IVE priest won't have to drive himself for 1 ½ hours. He makes the sisters spend twice the money on gas, so that he will not have to spend half of it. IVE Consitution: "Choose The Worst"
What makes this all even stranger is that common IVE practices like these (and many others) are in stark contrast with the Institute's own constitutions which says in paragraph 67 that a member should "prefer for his own use and to choose, whenever possible, that of least value, the least pleasant and the most uncomfortable" and "accept with joy, for the love of God, privations even in necessary things for the sake of holy poverty." This may indeed surprise the seminarians, but it does not surprise us, because as we have pointed out before and will elaborate further in the future, the IVE superiors don't really follow their own constitution. They just use the document to manipulate those in their care - especially seminarians and sisters. They demand what is for all purposes blind obedience from those in formation, while they wouldn't obey Pope Francis when he was their Archbishop in Argentina. They force poverty on seminarians (who are mostly undocumented immigrants, essentially trapped at the seminary) while the same seminarians pour them wine and serve them dessert on a nightly basis. Many of the seminarians and sisters probably think it's just a "cultural thing", "Argentinians are just funny that way", which is why the humility and simplicity of Pope Francis - now the most famous Argentine of them all - must come as quite a shock. Now a priestly office certainly deserves deference and respect from others. Often people will want to honor Christ by being kind to a priest and there is nothing wrong with that either. The problems start when people begin to feel entitled to or demand special treatment. This is the path to priestly narcissism. A sense of "being special" fostered by the IVE prior to and during formation, turns into a sense of entitlement as a priest. This entitlement leads them to justify all sorts of behavior, even openly flaunting their vow of poverty in front of their seminarians on a daily basis and demanding service from them like waiters at a restaurant. In their eyes, receiving the priestly character at ordination isn't seen as an added responsibility, instead it is treated a license to flaunt the rules. Ultimately, like Christ, a priest is called to serve, not to be served. Unfortunately, rather than provide an example to those in their care, the IVE priests lord it over them. They set a bad example for seminarians and damage their formation in the process. This is doubly unfortunate considering that we are currently so in need of properly formed priests. How Many Leave the Institute?